As you know, we’re always on the look-out for new and exciting cafes. These need not necessarily be ‘new’ in the normal sense, of “just open”, but more so, new for us in terms of experience. So when I was googling new places to try (yes, even us, food bloggers rely on The Google :P), and came across Tana Cafe, a Japanese styled cafe, I knew we had to come in for a visit. So I grabbed The Boy (and told him to drive) and Iron Chef Shellie, my real other half and came for a visit. I thought this would pave the way and get our creative juices going for when the three of us are in Japan this year. Luckily for us, when we rocked up, we were the only customers in attendance. This meant that we were able to choose the best seats in the house, which were the seats facing the barista bench on the communal table. 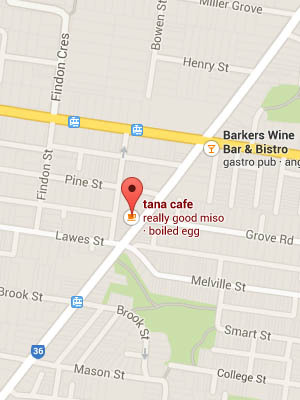 Tana Cafe is tiny. Extremely tiny, and so are the chairs. So if you are thinking of bringing your little ones here, please note that there will not be much room at all for your giant prams, let alone human space. That being said though, there are really cute children’s books in both English and Japanese lined on shelves on one of the walls. So maybe, leave your pram outside, and snuggle up in the cosy interior with your little ones inside! 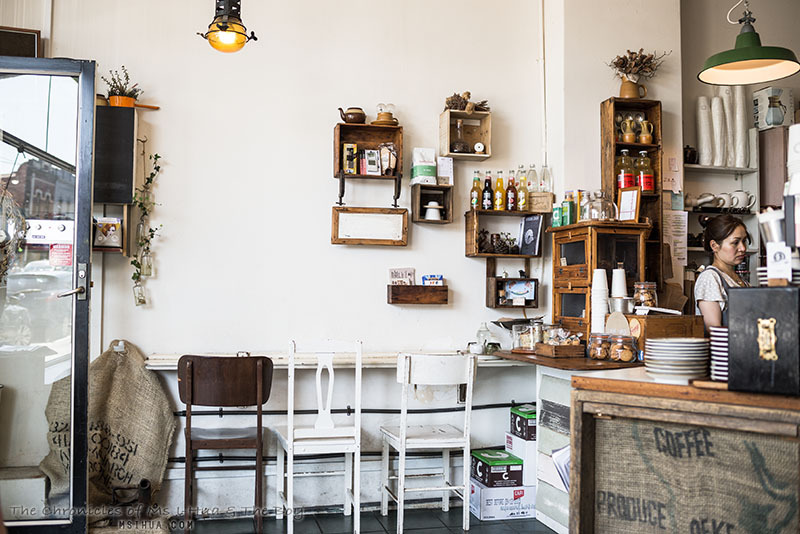 What little space they have, they make do with minimal vintage decoration in a very cute and quaint manner. Their menu is straightforward and minimalistic. 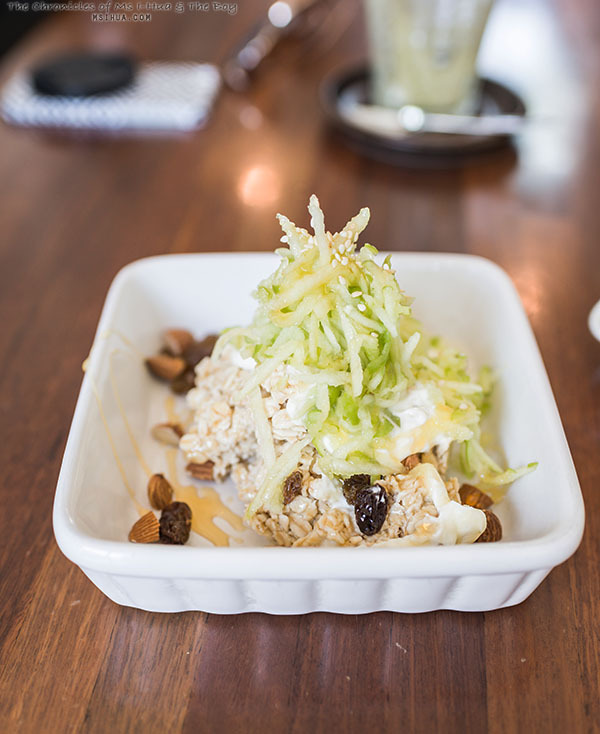 Simple Japanese flavours melded to modern Australian cafe brunch fare. Having read up before hand, I knew we had to order their House Made Sweet Green Tea (Matcha) Latte $4. Which did not disappoint. Robust, with a hint of roast and smokiness, Iron Chef Shellie and I ordered two glasses each! It was that good! The Boy ordered a decent Latte $3.80. Having made the assumption based on the pricing on the menu for the breakfast items, we decided to order a dish each and then some. Iron Chef Shellie ordered the Bircher Muesli $10 which had organic oats soaked in organic apple juice served with yoghurt, grated apple, almonds, raisin, sesame and honey. 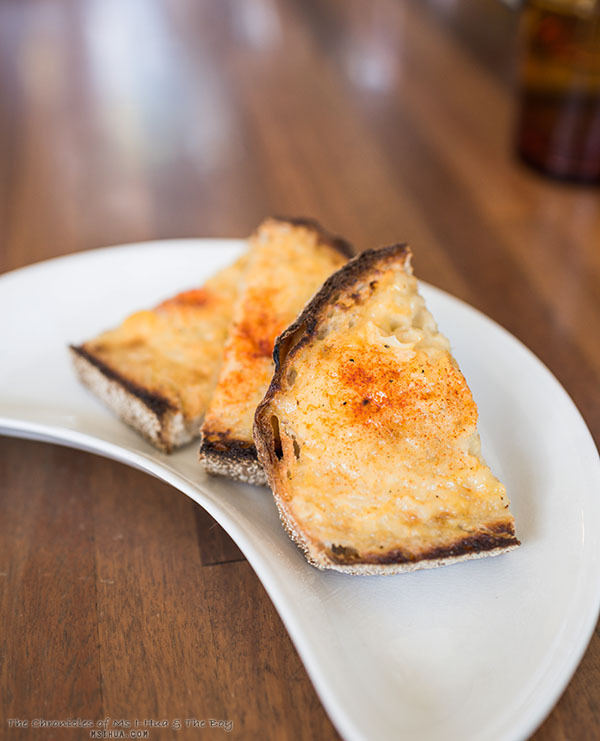 To share, we ordered the Corn Mayo Toast $6 which was creamed corn, Japanese mayo, caramelised onion and pepper on toast. This, we could eat all day sitting in front of the telly. Okay, maybe not all day, but it certainly was delicious and we couldn’t stop with just one slice. For my main breakfast meal, I ordered the Croque Monsieur $7.50. At that price, this is the most affordable croque monsieur I’ve ever encountered in a Melbourne cafe and it was certainly tasty. 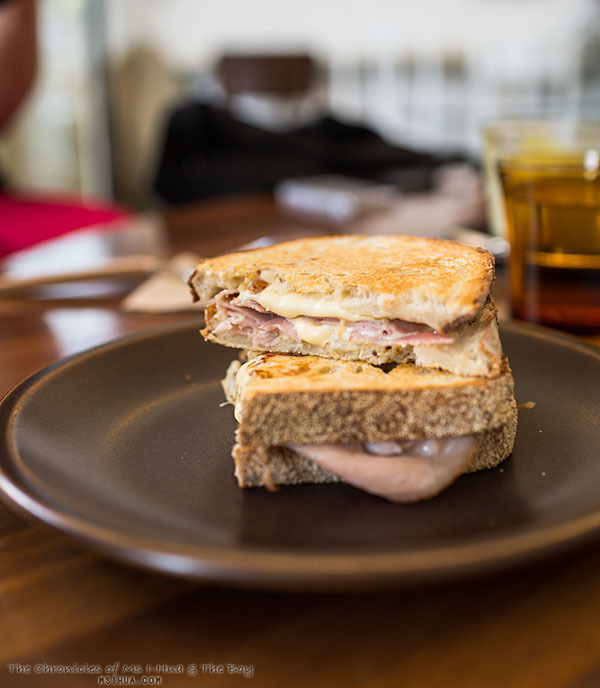 Miso flavoured bechamel sauce, tasty cheese, ham, caramelised onion, whole grain mustard sandwiched in slices of sourdough bread. 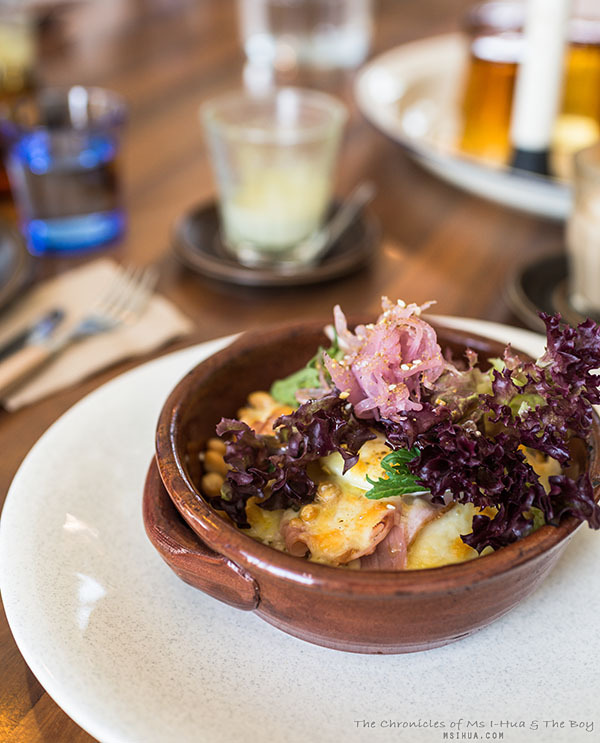 The Boy ordered for himself the Rice Gratana (Japanese style rice gratin) $14 with miso flavoured bechamel sauce, tasty cheese, boiled egg, ham, soy beans, lettuce and dukkah on brown rice. 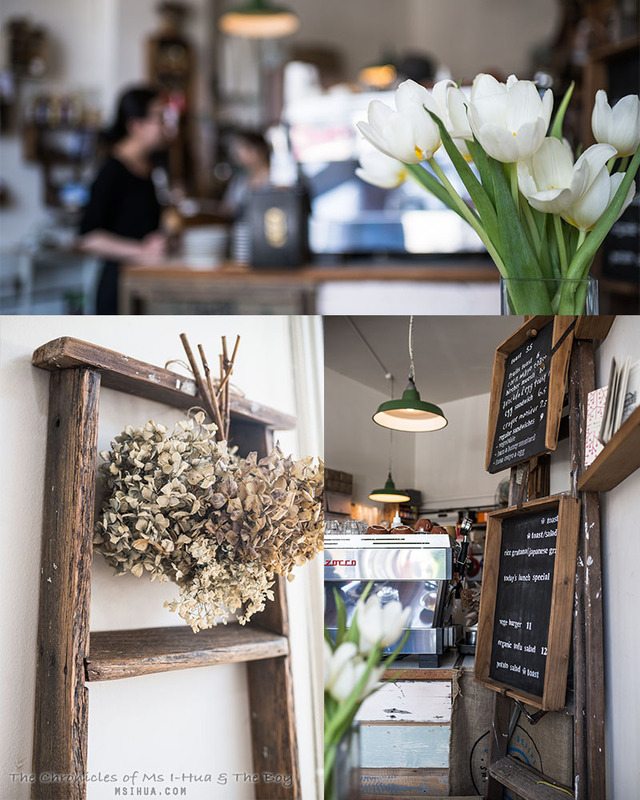 So if you’re opting for something a little different from the everyday bacon and egg, and smashed avocado breakfast fare, why not head over to the quiet end of Hawthorn and discover this little hole-in-the-wall cafe. I can assure you will be pleasantly surprise. 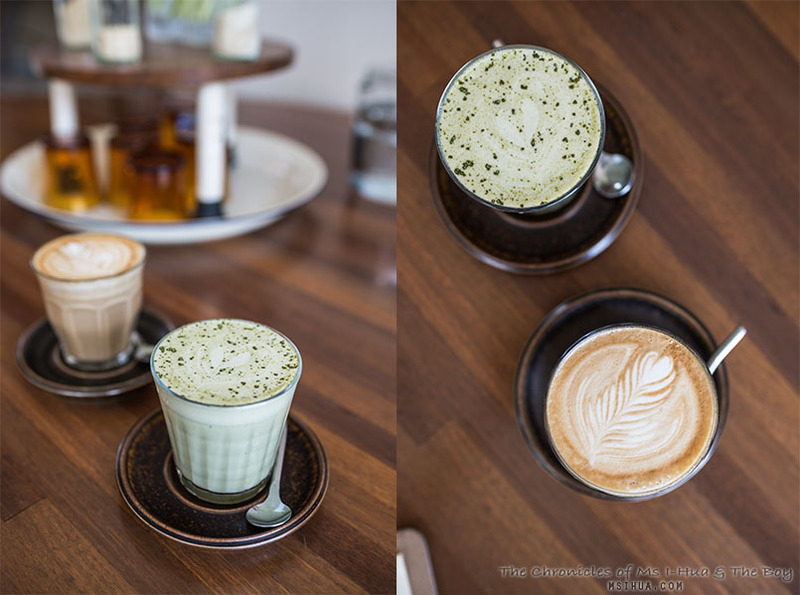 Also order two serves (or more) of the matcha latte *slurp*! I love the little nods to Japanese cuisine along the way- the miso bechamel, the Japanese mayo. The matcha latte looks amazing with the little flecks of green on top.